The movie in figure 1 shows the dots moving away from each other. For each pair of dots, their relative speed is proportional to the distance between them. However ... Note that the individual dots do not get bigger! The dots can represent atoms in the intergalactic gas, or dust particles, or any other physics where the intra-particle forces are strong enough to preserve the size of each particle, while inter-particle forces are not strong enough to overcome the “tidal” stress that tries to make everything expand. The distinction I’m making is important, because if our rulers etc. expanded along with the universe, the expansion would be unmeasurable and indeed meaningless. Note that the movie can be considered a portrayal of the entire universe. Of course the universe does not have an edge. If you are concerned about the apparent edge that appears in the figure, you can impose Born-von-Kármán periodic boundary conditions. That is, imagine connecting the right side of the dot-filled region to the left side, and connecting the top to the bottom, to form a torus. Then there are no edges, and no center. The dots move apart as the torus expands. Meanwhile, figure 2 lets us address the same point in another way. The red spheres represent free particles, free to slide relative to the ruler. (Credit: reference 1, in which a similar figure appears.) The question for today is, what happens to these three objects when the universe expands? Asking “what happens in this situation” is tantamount to asking “what do we mean by distance”. This is an important question, since distance is a rather fundamental concept. Until you get a handle on what distance means, you will never really understand gravitational waves, or the expansion of the universe, et cetera. The answer is depicted in figure 2. It shows some red beads sliding on rulers. To an excellent approximation we can use the rulers to define distance, and we shall go into some detail on why this makes sense. By symmetry, the center of the ruler follows its own geodesic. Since the ruler is rigid, the other parts of the ruler must keep pace with the center. The diagrams are drawn using a frame of reference comoving with the ruler, which means the center-of-ruler geodesic is a straight line in this frame. 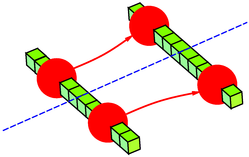 Because spacetime is curved, free particles such as the beads will tend to move relative to each other. In particular, the red beads will move relative to the ruler. Each red bead follows its own geodesic. Each particle’s geodesic is straight, or is at least “looks” straight to that particle. The geodesics in this case start out parallel, but do not remain parallel, because of the curvature of spacetime. The details of how this happens are discussed in reference 2. Let us accept that expansion of the universe causes free particles to move apart, and return to the other side of the coin, namely the question of why this does not cause atoms, molecules, rulers, etc. to expand. Let’s be clear: Rigid objects would expand if they were not bound by chemical bonds or other forces. Indeed you could say that the rulers do expand a tiny bit. They do feel a tiny amount of tidal stress associated with the overall cosmological acceleration. However, before they have expanded very much, the springiness of the chemical bond provides a countervailing acceleration, so there is no further net acceleration and no further expansion. The total effect is unobservably small, because the cosmological acceleration is so small. The spring constant of the chemical bond is strong enough to overcome it, with factors of millions upon millions to spare. The bottom line is that we can use rulers to define what we mean by distance, since the size of the ruler is determined by the size of the atoms that make it up. The size of atoms is determined by things like Planck’s constant and the mass of the electron, which are not affected by gravity. By the early 1960s the Hubble expansion was well documented. This could be explained by a big-bang model or by a steady-state model. The observation of the microwave background radiation put the kibosh on the steady-state model, since the big-bang model could explain the radiation while the steady-state model could not, as we will discuss in a moment. Philosophical remark: When a theory survives a test like this, the theory becomes more credible, but not because the test is evidence for the theory, but because the test is evidence against some of the alternative theories. Observation: Red shift versus distance. In the cosmos, any two free particles are moving apart, at a rate proportional to the distance between them. Interpretation: Expansion of the universe. Basic theory: Free particles are “pulled” away from each other by the expansion of the universe. It looks like a tidal stress; i.e. the particles accelerate away from each other. On the other hand, atoms, rulers, stars, and even galaxies are sufficiently firmly bound that they can resist this stress, so they do not expand. This is important, because if rulers expanded along with the universe, the expansion of the universe would be unmeasurable and indeed meaningless. See section 1. Basic theory & observation: Gasses cool as they expand. This includes relativistic gases including photons. Steady state theory: Universe expands, but the density and temperature remain the same, because new matter is somehow created to “fill in the gaps”. No way to predict background radiation. Big bang theory: The universe cools as it expands. If you run the movie backwards, you see that at earlier times the universe must have been much hotter. At some early time, it must have been hot enough to ionize all the atoms. Such a cloud of ions is a plasma, and is opaque to electromagnetic radiation over a wide range. This particular cloud is called the cosmic fireball. Suppose you look at the sky in some random direction. Follow your line of sight outward until you hit something opaque. You might hit some foreground object, such as a star, but if you don’t, you will eventually hit the cosmic fireball. The observed background radiation is just the light from the surface of the cosmic fireball, duly redshifted. If your line of sight passes through interstellar gas, that doesn’t matter. Unionized gas is highly transparent to microwaves. On the other hand, you can’t use light or microwaves to see anything earlier than the cosmic fireball, because the plasma is opaque. See also reference 3 for pointers to further information. C.W. Misner, K.S. Thorne, and J.A. Wheeler, Gravitation (W.H. Freeman, San Francisco, CA, 1973).